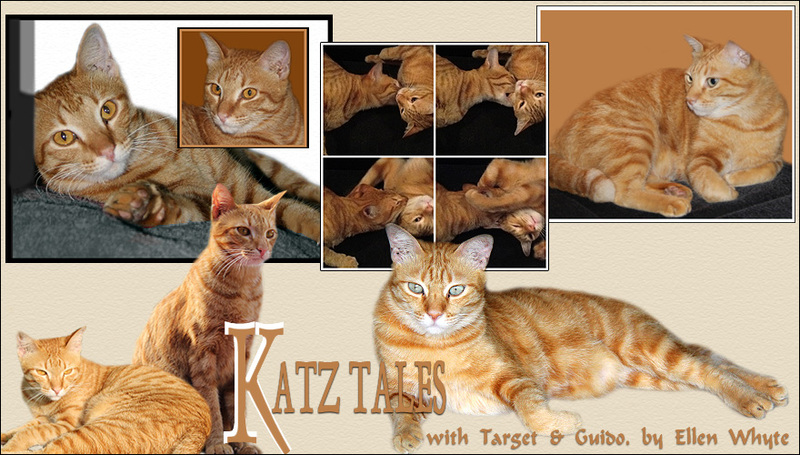 Katz And Other Tales: Guido: My First Rat! I caught a Rat! A Real Live Rat! I'm the Greatest Hunter in the Universe! This is me with my Rat. This is me Whapping the Rat. This is me Tossing my Rat. This is an Olympic Sport, I think. I lent my rat to Target because I am a Furry Nice Generous Cat. This is me, looking for my next Rat. This is also my First Post. It's a big week for Firsts. Oh goodness Guido! Me and Charlie are about to log off the pc and go to bed (it's nearly midnight here) when your blog post pops up and we're like "WHOA!!!!"! LOL! you are the rat's worst enemy. more combat war to come!!! OMC, a rat! A real rat! That rat-toss definitely is Cat-O-Lympic material. Wow!!! Master Hunter Guido! That has a nice ring to it!!! WOW!! That is so pawsome! You are a mighty hunter indeed! We could use you around here for catching the mice which are like little, delicate bite sized rats. OMC!! You caught a rat, Guido? Wow - way to go, friend!! They are fun to toss around, aren't they? MOL!! Wow! You are indeed a great hunter! Oh my Guido! You are the MAN! The Mancatliest ManCat of all! I has never even see a rela, life, fresh rat. I has the IMPRESSED! A toy and a meal - that was a great catch! We're very impressed! That is awesome, Guido! Paws up! And yes, rat tossing SHOULD be an Olympic sport. OMC!! The only rats we have here are pink and green and you can't nom them!! Hang on. That's a REAL rat?! Scary! How fortunate for your humans that you're such a ferocious hunter! That's great rat-throwing! Well done Guido. We gots one here. Little Ms Smokey, one of the outside kitties always finds a rat or mousie, well almost every day, and after she whaps it around and plays with it she will leave it on the door mat in front of the kitchen door for Small One and me. She's such a good kitty too. Us beans are all proud of our mighty little hunters. Yes we are. Happy Holidays, Merry Christmas, and what ever greeting you are used to. Hope everyone has a great holiday week and weekend and all stay safe, keep warm and dry, and will come see us when you can. Guido, excellent first post! Holy Moly, a real live rat, that's something else! Guido, you are a very clever hunter! And for sure, rat tossing should definitely be added to the Olympic sports. Good luck finding your next one! Congratulations ! You are a good hunter, but please leave your rats and mice outside and don't put them besides your servants bed ! You're such a big mancat now, Guido. Blogging and catching rats. Whatever next! We should get you your own TV show! Wow, Guido, good job catching that rat. We like to whap them around too. How generous of you to share the rat. Hope you get another one. Take care. Pawsome Catch Guido.... Excellent work. OH Concatulations Guido! My girl got to catch one about 6 weeks ago..I was SO PROUD of her!!! And you shared with Target!! You are a special boy! What a great catch Guido and we hope you had lots of fun tossing him in the air and deading him again. What a great hunter you are. oh, guido!! conRATulations!! good for you!! Good job, my friend! I am certain my kitty brothers and sister would not have clue on what to do if they saw one of those! You are our hero! Such technique in your rat tossing! Ugh...poor rat. But good job, Guido! ConCATulation to your great catch !!! Oh my, real rat! You sure are the greatest hunter, Guido! I am very impressed with your Mighty Hunter skills Guido! You are a very talented hunter. This Can't Be The Real Meaning Of Boxing Day! Target: Bet You Can't See Me! Logomania Fate & Fortune, our new book is out!